The Tadd Dameron vocal project is finally here! My deepest gratitude to everyone who participated, especially the musicians and Systems Two Recording Studio in Brooklyn, NY. This has been a project that I have wanted to do for so very long! I know you will enjoy it once released. 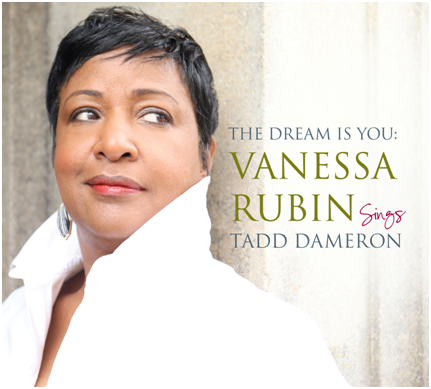 See the Dameron page at vanessarubin.com for many photos and more details about Tadd and his music. See my Upcoming Events page for future dates! Check out my “Times to Remember” page to see the moments you missed. Make sure you leave your name and email address for my mailing list and newsletter! Come on in and make yourself at home as you peruse through my world. Read about my personal and professional background. Learn about my current activities and where I’ll be singing next. Listen to some of my music that I hope will make a welcomed addition to your musical library. Become a friend as well as a fan. There’s quite a bit for you to check out and comment on, if you like. Have fun, enjoy the visit and come back as often as you like. The music is STILL HOT!! Be sure to check my performance schedule for MUST SEE live performances near you! Performance Schedule.